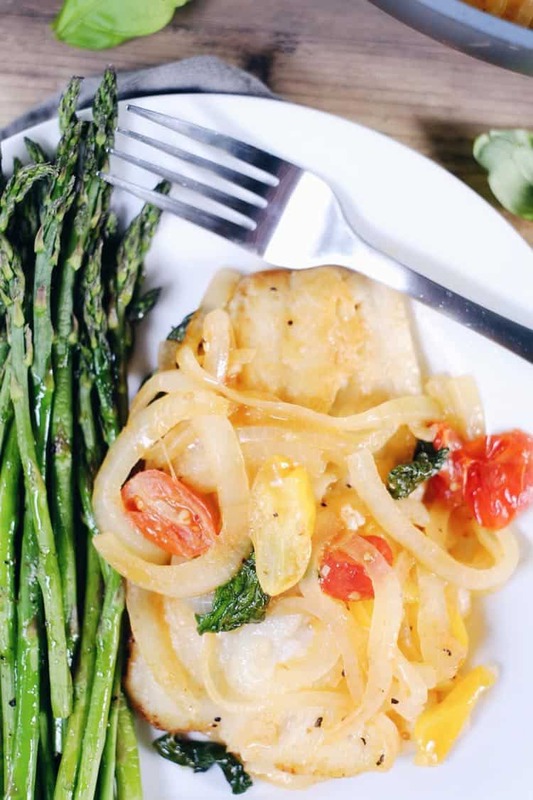 We love finding and creating new ways to add more fish to our diet, and this tomato basil cod with asparagus is a recent concoction and favorite! It feels fancy, but is really pretty dang easy and quick to make! We like cod because it cooks really fast, like 4-6 minutes, and it is also affordable. It is also pretty mild in flavor and will take on the flavors of whatever you cook it with. What is your favorite fish to cook? 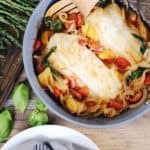 Paired with the tomatoes, onions and fresh basil in this recipe, the cod is aromatic and slightly sweet. 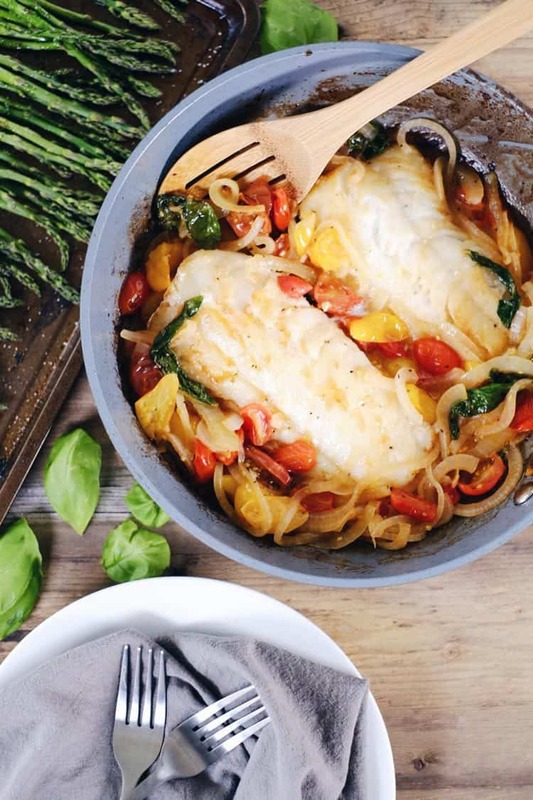 We love pan frying cod with grass-fed butter, but you could also use ghee or coconut oil for dairy-free. Who doesn’t love a meal that tastes and feels elegant and fancy, but takes less than 30 minutes to make?! Am I right? Seriously, it’s a real no-brainer! 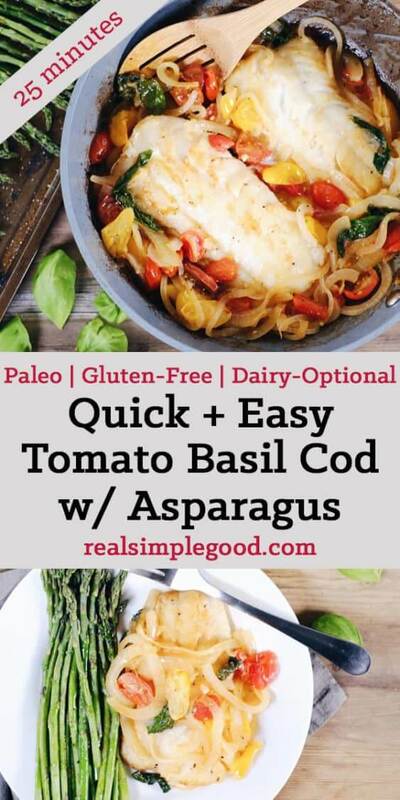 Get this tomato basil cod with asparagus on your schedule and make it happen! Get in the kitchen, and create this quick and easy dish! You will impress your family or friends and come out looking like a kitchen star! Let us know how it goes by leaving a comment below. Also, take a photo and tag us on Instagram @realsimplegood, so we can check it out! 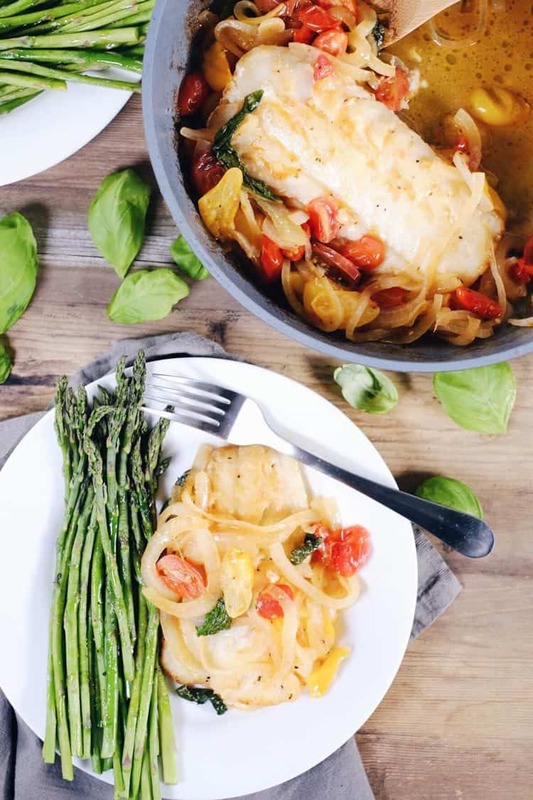 This tomato basil cod with asparagus is a quick and easy favorite! It feels fancy, but is really simple and quick to make! Prep cherry tomatoes, onion and garlic as noted and preheat oven to broil. Place 1 tbsp avocado oil in a large skillet over medium heat. Once pan is hot add, garlic and onion, stirring occasionally. Once garlic is fragrant, add cherry tomatoes. Turn heat to low and let them cook down, stirring occasionally, until they are blistered and wilted looking. While the tomatoes are cooking, cut the thick ends off asparagus and place a baking sheet. Drizzle 1 tbsp of avocado oil over asparagus and season with salt and pepper. Once tomatoes are broken down a bit, add white wine (or bone broth), lemon juice, basil, salt and pepper to pan. Stir and cook for about 2 more minutes. Remove from heat and place in a small bowl. Place asparagus in oven. 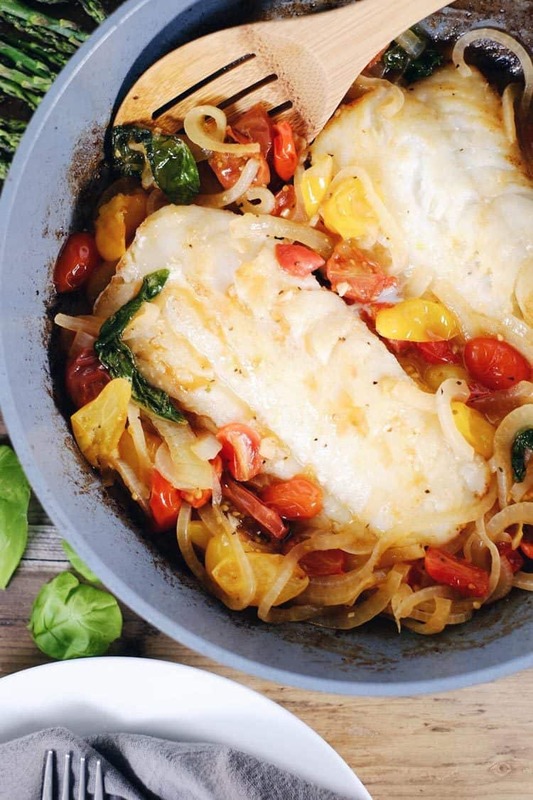 Add grass-fed butter or ghee to pan and place cod fillets in pan. Season the top side with salt and pepper and cook for about 3 minutes. Flip, season other side with more salt and pepper and cook for 3 more minutes or until the fish is flaky with a fork. Turn the stove and oven off removing asparagus from oven and plate. Place cod on plates and spoon the tomato basil mixture over the top. Add asparagus to plates, serve and enjoy!